Selena Quintanilla is the ultimate border-crossing queen. Born in Lake Jackson, Texas to a Mexican-American family, she managed what seemed impossible: she made crossover hits out of songs that combined elements from both sides of the border. But Selena doesn’t just exist at the intersection of cumbia and funk, of pop and tejano sounds, of Mexico and the United States. Her entire cultural persona (both in life and since her death in 1995) consists of straddling seemingly incompatible concepts: she’s glamorous yet down to earth, approachable yet untouchable. She’s become an icon of and for the people. Ostensibly offering a by-the-numbers biopic of the Queen of Tejano music, Gregory Nava’s 1997 film on the singer understands this all too well. Starring none other than Jennifer Lopez, Selena is a portrait of a woman caught between her different worlds but eager to meld and bind them together. Moreover, in its portrayal of a fearless woman navigating how to claim and deploy her sexuality, of a diva learning what it means to have an adoring audience at your beck and call, and of a daughter yearning to be seen and understood by her father, Nava’s classic remains a coded queer call to arms. One need not look further than its opening sequence to see just how attuned to an imagined (though perhaps inadvertent) queer audience this late 90s film is. After scrambling to find her chosen outfit for the evening, a sparkly purple jumpsuit, an effervescent Selena heads out into Houston’s Astrodome atop a horse-drawn carriage before being delivered to her stage. Surveying those gathered at the famed venue, the singer welcomes the crowd (“How you doing Houston, Texas?”) before opening the sold-out show with what has to be the gay anthem of the late 20th century. “First I was afraid, I was petrified,” she sings, “Kept thinking I could never live without you by my side.” Kicking off a movie we all know will end in murder with “I Will Survive” is in itself a delicious kind of wink. After all, if Selena Quintanilla has survived at all, it’s because of her music and her fans—the very two images that opens Nava’s film. But beyond this playful irony lays the song’s more underground message. Danced at Pride parades and gay bars for then close to two decades, “I Will Survive” is a glorious exaltation of the strength of those often cast aside and looked down on. Here’s where Selena’s story, which Nava’s film eventually flashes back to and fleshes out, speaks quite directly to the LGBTQ community. In sun-dappled scenes set in Corpus Christi, we see how Selena’s voice impresses her father Abraham (played by Edward James Olmos) enough to revive his lifelong love of music. With Selena’s begrudging brother and sister in tow, the Quintanilla patriarch dreams up “Selena y Los Dinos.” Playing mostly at the family’s Mexican restaurant singing standards (including that other gay anthem, “Somewhere Over the Rainbow”), the young trio soon begins booking bigger gigs on the strength of its star singer. By the time they have to hire a guitar player and settle on long-haired rocker Chris (Jon Seda), the central dramatic tension of the film reveals itself: can Selena, now a woman coming into her own, fulfill her father’s expectations while also embracing desires that run the risk of pulling her away from his orbit? Case in point: before Abraham blows up over Selena’s romantic infatuation with Chris, their most heated disagreement comes from what would later become one of her signature looks. While singing “Baila Esta Cumbia” at an outdoor concert where she’s drawn a big crowd made up of mostly families, we see the performer discard her denim jacket and reveal a bedazzled black bra. While her sister and mother, with mischievous smiles, silently approve, Abraham is incensed. “She can’t be wearing things like that!” he bellows, “There are men out here!” The film frames this outburst as hypocritical; it’s no accident that Selena is singing about cumbia, the dance that as we’d learned a few scenes earlier, first drew Abraham to his wife. But it’s the first inkling that despite enshrining her family’s values, Selena is intent on following her own path, in her own terms (she made her own sparkly bustier, after all). Never quite rebuking tradition, she aimed to straddle the line between the strictures laid out by her father and the freedom she knew would come by trusting her instincts. Befitting Nava’s delight in visual metaphors to advance his protagonist’s plight (he eventually opts to deny us access to the scene of her murder, giving us instead a spotlit Selena failing to catch a white rose while singing alone on a stage), the film wraps its most resonant message in an otherwise mundane image: Selena leaping off a bungee jump platform at a street fair after the attraction’s engineer point blank tells her that “the hardest part is letting go.” That sense of flight and freedom leads right into her decision to marry Chris against her father’s wishes, a prospect as scary as it is liberating. Nava’s film captures Selena in all her glory, making her fearlessness her most admirable trait. And, much like the film’s poster, Selena also embodies the singer’s ebullient spirit: she’s a bright toothy smile framed by dark red lips, radiating the warmth that drew so many to her and made them feel known, seen. Pushing back against images of blond, blue-eyed waifs that ruled the airwaves in the U.S. and dominated the telenovela imagery in Mexico, Selena spoke to those girls (and boys) who rarely saw themselves up on stage or on screen. In centering her story on the emancipatory effects of following desires those around you deem wrong, Nava furthered the queer legacy of the Queen of Tejano music. As San Antonio-based artist Franco Ruiz Mondini puts it in Lourdes Portillo’s Corpus: A Home Movie About Selena, the “Como la flor” singer helped make visible a queer latinidad that had long remained in the closet. Just the impact of seeing drag queens lip-syncing to Spanish-language songs was revelatory: “people were just like, ‘I am someone. This area I come from, I can be just as glamorous as anyone else,’” he remembers. Nava’s film lovingly places Selena’s Mexican-American working-class roots front and center. Its most joyful moments stress both her DIY spirit (that bustier, those cowhide outfits she designs) as well as her girl-next-door vibe (which attracts the guys who love “Salinas” so much they don’t care to wreck their own car as well the pre-Grammys mob she gathers at the mall). Therein lies the reason why the Quintanilla singer has long spoken to boys and men like Ruiz Mondini: Selena embraced all of her complexities with aplomb and crossed borders not seamlessly but insistently (“Estoy muy… excited!” as she puts in her Mexico press conference, embracing her in-betweenness with gleeful abandon). It’s no surprise her story and image have long resonated with the queer community. That’s even more miraculous considering that Selena’s legacy has long been policed so as to downplay the queer undertones that color that image. 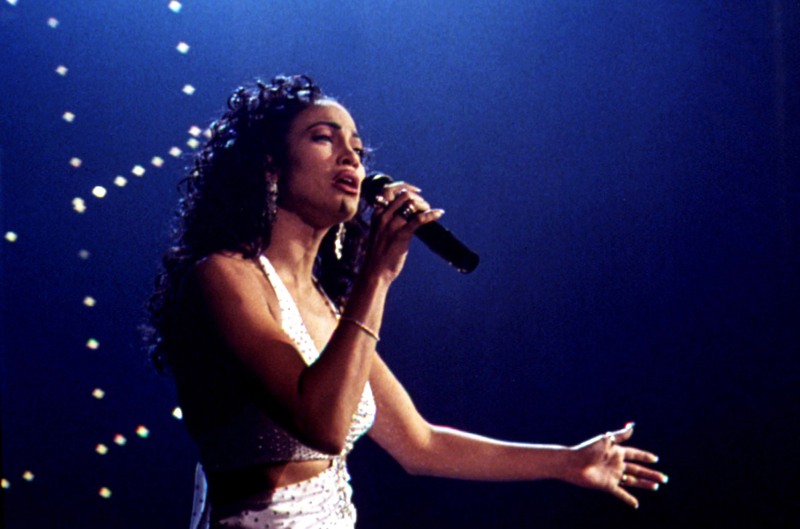 Portillo’s 1998 documentary, which featured images of a Selena drag impersonator as well as speculation about the singer’s relationship with Saldivar, prompted Abraham Quintanilla to sue, blocking a planned film festival screening of the film. Moreover, Hugo Salcedo’s play Selena, la reina del Tex-Mex: obra en doce cuadros, in itself an exploration of the late singer’s many border-crossings that premiered the same year as Portillo’s documentary, opens with a drag queen impersonating Selena called Unión Americana and also suggests a lurid romance between Saldivar and her employer. Those twin images, the gay man infatuated with the “Bidi bidi bom bom” singer and the criminal lesbian, haunt Selena’s legacy and lurk on the edges of Nava’s near-reverent biopic. The former lives on in the perhaps unintended subtext of the film while the latter comes through because of its own absence. It remains curious, for example, that Nava would cast the great Lupe Ontiveros (they’d worked together in El Norte and My Family) as Saldivar despite being two decades older than Selena’s murderer. The age discrepancy makes the interactions between Lopez and Ontiveros feel familial, scrubbing them of any illicit undertones. Yet while the film is fascinated with Selena’s rise to stardom and spends plenty of time locating her as a role model driven by romance and ambition, Nava’s script seems almost indifferent to the events that led to the strained conversation in a Days Inn Motel that left her dead. While fans and journalists alike had spent the months since her murder trying to map out what happened in that motel room, Nava’s storytelling never quite digs deep into what drew Yolanda and Selena together and then eventually apart, crediting their closeness to a kind of motherly bond and their schism as rooted in illegal business dealings. These unnecessary gaps are left open by the film—the better for knowing audiences to color the gaps therein, perhaps. As with many recent queer classics, Selena exists in that space where the implicit and explicit commingle. The film may not even feature the one Selena song that’s become a gay anthem in its own right (“Amor prohibido”) but its final number, the English-language number “Dreaming of You,” abstracts its romantic subtext so much so that it begs to be queered. When we see Lopez croon, “So I wait for the day, and the courage to say how much I love you,” in an otherwise empty stage it’s unclear who she’s referring to. The ambiguity may not be baked into the song’s lyrics but as a stand-in for the violent altercation that culminated in Selena’s death, Nava grafts the frayed Yolanda/Selena relationship onto a loving ballad. Like its opening number (the life-affirming “I Will Survive”) Selena’s ending hints at a queer reading that demands we navigate across different discourses, placing us squarely in the liminal spaces where this undisputed Queen lived and died: in her music and in our dreams. Manuel Betancourt (@bmanuel) is a New York City-based writer. He’s a pop culture enthusiast and an eternal Buffy fan. His work has appeared in Film Comment, The Atlantic, Vice, INTO, and Esquire, among others. He’s a regular contributor to Remezcla and Electric Literature. Oh, he also has a PhD but doesn’t like to brag about it.